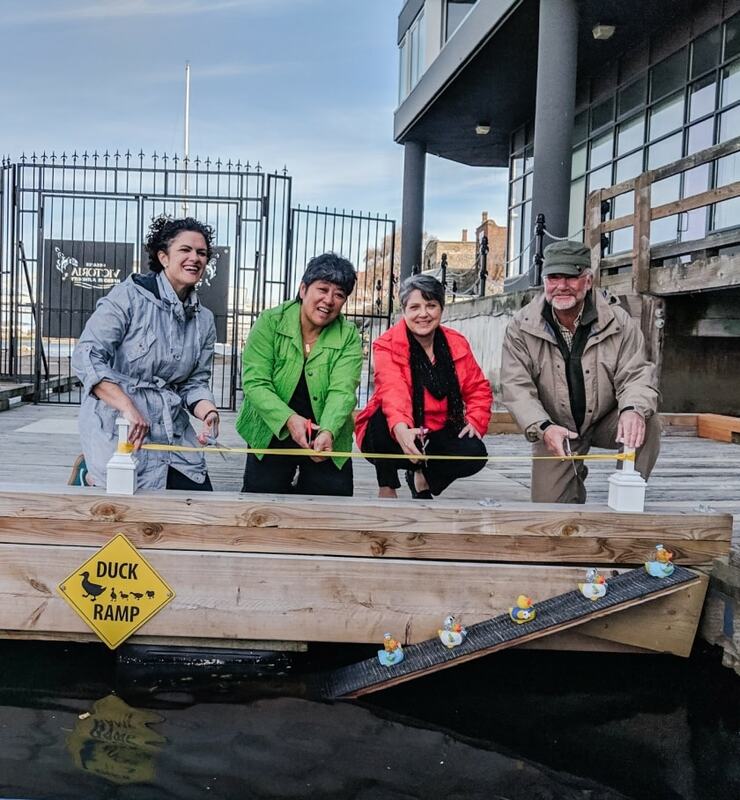 Greater Victoria Harbour Authority (GVHA) has installed six mallard duckling ramps at the organization’s four Inner Harbour marinas. Today, a small ribbon cutting ceremony was held at the Wharf Street marina to officially ‘open’ the ramps for the season. Shannon Greenley, Inner Harbour Operations Manager for the Greater Victoria Harbour Authority was joined by City of Victoria Councillor Charlayne Thornton-Joe; Erika Paul, Senior Animal Protection & Outreach Officer, BC SPCA; and Jacques Sirois, Victoria Harbour Migratory Bird Sanctuary, to celebrate the opening. Last year, a local resident alerted the community to the lack of duckling ramps throughout the harbour, which was then brought to the attention of GVHA as a land-holder. To be proactive and assist with the 2019 flock, GVHA staff worked with community organizations including the City of Victoria, BC SPCA Wild ARC, and the Victoria Harbour Migratory Bird Sanctuary to collect intel and implement best practices, which led to the creation and installation of new ramps. Each spring, several mallard ducklings make their way with their parent(s) to the Inner Harbour. Once in the water, they sometimes struggle to find a space to get out. The installation of the new ramps is part of the bird-focused initiatives that are underway throughout GVHA properties.